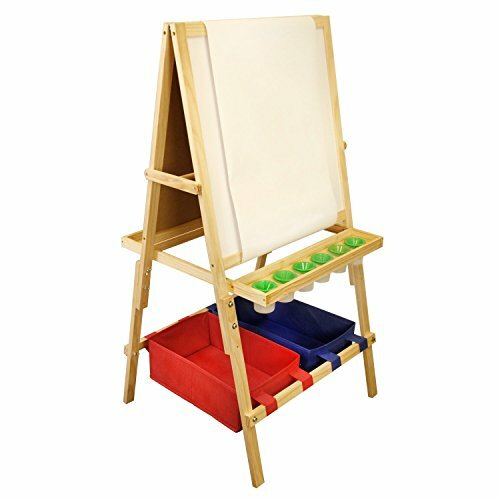 Constructed of solid pine, this easel features large trays on both sides and generously sized 23-1/4" x 23-1/4" white board and chalkboard surfaces as well as a hidden paper roll that feeds over either side. It can be converted to a table top easel with attached rubber feet for surface protection. The adjustable legs accommodate users of different heights or can be adjusted from 46" to 54" as a young artist grows. The sturdy, washable bright red baskets provide convenient and ample built-in storage space. Light assembly required. Base dimensions are 26-1/4"W x 23"D. Table top dimensions are 26-1/4"W x 31-1/2"H x 15-1/4"D. Weighs 22 lbs. Constructed of solid pine, this easel features large trays on both sides and generously sized 23-1/4" x 23-1/4" white board and chalkboard surfaces as well as a hidden paper roll that feeds over either side. The adjustable legs accommodate users of different heights or can be adjusted from 46" to 54" as a young artist grows. Table top dimensions are 26-1/4"W x 31-1/2"H x 15-1/4"D. Weighs 22 lbs. * Light assembly required.